Women earn less than men. In the US the gap is approximately 22%. Among OECD countries the gap averages 15%. One might argue this indicates rampant discrimination. But the story is far more complicated. Many women earn more than men, and for those that earn less, the gap is not uniform. For 55–64 year olds in the US the gap is close to 25%, yet for 16–24 year olds the gap is just 5%. For single-never-marrieds the gender gap is about 5%, but for married men and women the pay gap is almost 23%. Children exacerbate the gap between 2% and 10% per child, and the gap is even bigger when children are spaced widely apart. In contrast, the median salary for full-time young single women in a number of metropolitan areas exceeds men’s by over 8%. These same patterns persist across most countries. The gender wage gap for marrieds is between 3 and 30 times greater compared to singles. Similarly children widen the gap. If discrimination were the reason, then one would need a theory about why employers discriminate less against young childless women employees, but so much more against older and married women. Perhaps the explanation isn’t gender discrimination, but lifetime work commitment. Work patterns also differ by gender, marital, and child status. In 1970 US married men’s labor force participation rate was 86%; married women’s was 40%. In 2010 it was 76% for married men and 61% for married women. For singles these gender differences are much smaller. In 1970 the labor force participation rate was 66% for single men and 57% for single women, and in 2010 they were 67% for single men versus 63% for single women. Even today, many women still drop out to raise children. Studies indicate many are hesitant to work long hours. In short, single men and women accumulate experience at roughly similar rates, but married women accumulate far less labor market experience than married men. One cannot overemphasize the importance of work continuity. Dropping out is costly. Earnings power depreciates up to 5% for each non-work year. Those who expect to drop out tend to enroll in less job-related schooling and to take jobs with less training and lower earnings growth. The same is true for those who seek shorter work hours and smaller commutes. Over the last century female lifetime work increased dramatically, while male lifetime work has declined moderately. Concomitant with this gender work convergence is a decline in the gender earnings gap from approximately 70% in the early 1800s to the current 22% in the US. Similar patterns hold in other countries. Policies consistent with promoting greater female lifetime work effort have reduced the gender wage gap. One such policy is making day care more available. 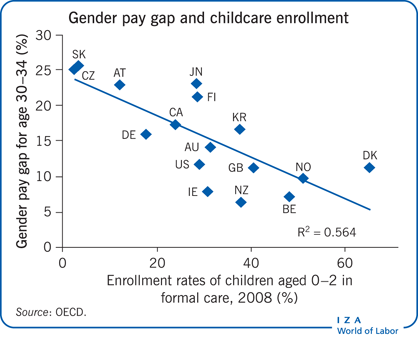 An analysis by the OECD finds smaller gender wage gaps in countries with greater day care enrollment. Lower marginal tax rates that encourage greater participation of women in the labor force would work in the same direction. Another IZA World of Labor article by Boris Hirsch (Leuphana University of Lüneburg and IZA) points to recent studies finding that imperfect competition in the labor market can account for a large part of the unexplained wage gap. The gap thus reflects “monopsonistic” wage discrimination—that is, employers exploiting their wage-setting power over women—rather than any sort of prejudice. Hirsch argues that many women, due to domestic responsibilities, tend to care more about commuting times or working hours than salary offered. While equal pay legislation may help prevent employers from exploiting their wage-setting power, Hirsch recommends addressing the sources of women’s limited wage sensitivity by investing in additional and better childcare or enforcing more flexible working time arrangements. Gender wage gaps are most pronounced in leadership positions. As Mario Macis (Johns Hopkins University and IZA) explains in his article, this is due to a combination of economic forces, cultural and social norms, discrimination, and unequal legal rights. Apart from social justice concerns, these gender disparities are economically inefficient because they imply a sub-optimal allocation of female talent. A common explanation of the gender pay gap is that attitudes towards competition differ between genders. Mario Lackner‘s (Johannes Kepler University Linz) article references laboratory and field experiments finding that women are more reluctant and less aggressive when it comes to initiating negotiations or applying for jobs with negotiable salaries. According to the article, such differences in competitiveness are formed at young ages and are relatively persistent, exerting a profound influence on an individual’s future career. Consequently, policy measures should be targeted at early childhood education and education systems in general. The driving forces of this ‘competitiveness gap’ are, however, still under debate. Moreover, closing the gender gap in competitiveness might not be desirable under all circumstances, as men are often found to be overconfident and over-competitive.